Whether stocking an emergency bag to serve the family or just planning to go hike and camp for a few days on the trail. The GSI Dualist Cookset leads the way in backpack cook sets by providing a lightweight, durable design and great features to serve up to a family of four. Our method of use for this cookware kit was to serve in one of our emergency bags (INCH Bag to be exact – click here for more details) while also being packable for camping or hiking trips from day to day. A large amount of time and effort went into finding the best cookset to meet our needs. Fortunately we documented the process to hopefully save others some time. Check out all the cooksets we tested, their specs, and the requirements we were looking for in this separate article. The Dualist cookset offers a number of features, many of which allow for multiple uses or functions of an item. This additional thought and ingenuity in the design helps to bring this system to the top. The cookpot included with the set is manufactured with hard anodized aluminum and is coated with a Teflon Radiance non-stick coating which is both abrasion and scratch resistant (see more on the coating from Teflon here). The aluminum keeps the kit lightweight and works well in correlation with the Teflon to heat evenly when cooking. There is no metallic taste to the food as found with some metal camp cooksets and I have never had a hotspot issue (uneven heating) with this cookware when used on a stove. When cooking stick prone items such as eggs, the non-stick coating makes for easy cleanup. Just a quick rinse with soap and water and you are ready to stow. No hard scrubbing required. The Teflon Radiance coating is supposed to be resistant to scratching with metal utensils, I try to avoid using them when possible, but even with a few uses, I have yet to see any damage to the coating. Granted this pot isn’t PTFE free (hence the Teflon Coating) but for the quality, features, and price point, it is the least of my worries. If you are looking for a great PTFE free system similar to this, check out the MSR Trail Lite Duo System which was our runner up. During our testing with the MSR Pocket Rocket, even with a low fuel canister, we were able to average between 12 and 13 minutes for a boil of a half pot of water in light wind (summary is below). We were more than comfortable with these results. One of the sacrifices that has to be made when you are looking for a non-stick system, is the ability to use the pot by seating it directly in a campfire. Non-stick pots are designed to be used with a stove system or being raised and supported above a fire. If placed in a direct fire, the life of the non-stick coating can be shortened by the excessive heat and your warranty can also be voided. For me, this is a small price to pay to have easy cleanup. If you need to cook with wood, you can carry a Solo Stove Wood Fire System to use for little additional weight. 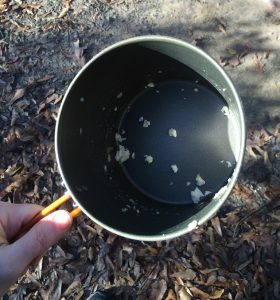 It should be noted that some reviews report users melting the plastic coating on their handle when they get it too close to a camp fire or don’t have the pot seated evenly on a stove. Keep this in mind when cooking, to protect yourself from burns and make your equipment last longer. Non-stick pots and pans are not designed as a direct campfire cooker. Go with the stainless steel version of this system, the GSI Glacier Stainless Dualist if you want to cook directly on the fire. Know this means, no non-stick, more clean-up, and additional weight. The pot lid seals well with a silicone O-ring making it easy to clean. Whether straining fresh made pasta or draining additional water from a morning meal, no water leaks from the rim when you apply a little pressure to the lid, all liquid strains through the strainer holes as it should. The handle to the pot is metal and coated in a plastic dip while the lid handle is made with a high temperature plastic. Both handles help protect hands from heat while in use. They do get slightly warm while in use, but are cool enough to use with bare hands. This adds a nice touch to the kit when most cookware requires gloves or a tool to hold. Make sure to flip up the handle on the pot lit before seating to help further reduce heat. Mind the Steam: Do be careful of the steam coming from the strainer lid once your meal is at temperature as you will be more likely to get your hand burned from the steam than the lid handle. The only negative I found was the lack of measurement hash marks on the side of the pot to help with measurements while cooking. Doing a little math in your head will get you in the ballpark (full pot is 1.8L, half pot is .9L, etc. ), but markings make life easier. Although each cup and bowl does have ounce and liter measurements which can be used instead, adding the markings to the pot would be highly beneficial and improve the user experience when cooking or boiling water. The Dualist system includes two cups and two bowls, each sharing a similar shape. The cups have a snap on lid with sip holes and an insulated “neoprene type” wrap to help keep your drink warm and alleviate spills. While the cup design of the GSI Dualist may seem a little odd at first glance (yes, it looks like a bowl), it really allows for the dish to be multi-functional. This design ingenuity is really what allows the cook set to be used for up to 4 people. The Dualist bowl and cup uses a nested design. This allows for minimal use of space when in stow leaving more open space for other items (i.e. 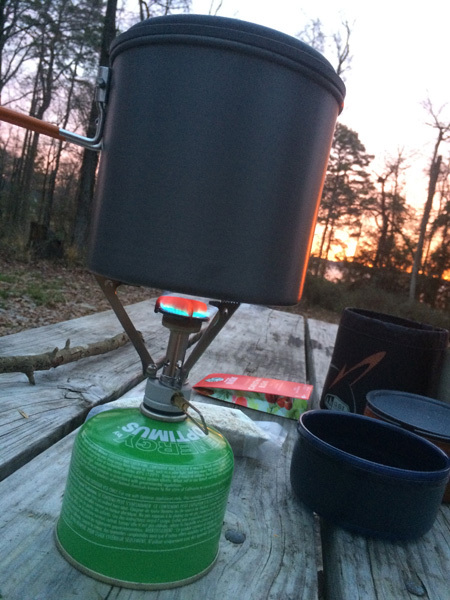 stove, isobutane canister, etc). The shape of the cup allows for it to substitute as another bowl when required, making this one of the only two person cook sets that can be used for up to 4 people. Worried about the insulated wrap getting dirty because you are using it for food? Just slide it off and stow it away. The cups offer a wide base allowing them to maintain stability on multiple uneven or steep surfaces where other narrow cups would fall over. This is also a great shape for kids allowing enough surface area for a secure two hand grip to limit spills. During our use in colder temperatures, we found that the cups insulated wrap works, but doesn’t keep your drink warm as long as some competitors. During testing, our drinks were poured straight from a boil into the cup, then mixed with coffee and 2 creamers at outside temperature, and capped with the lid. The results below show the respective time it took for the drinks to cool to around body temperature (when they no longer felt warm to the mouth). This isn’t a problem for my family as hot drinks disappear quickly when cold, however, it may be an issue for some. If you only need to use the set for one or two people, you can use the bowls to keep your drinks warmer longer as described below. Another testament to the multiple functionalities capable with this set. On a cold day, if there is no need for a bowl and a cup, you can just use the cup and keep it nested in the bowl to give you an extra layer of insulation keeping your drink warmer, longer. Granted, this does limit you to only two person use. 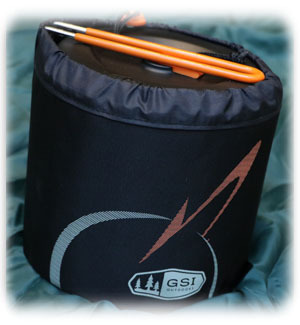 In addition to being used to stow the cook set during transport, the GSI Dualist stuff sack has welded seams and will hold water allowing you to use it as a sink. This is a brilliant feature allowing you to the capability to clean dishes in an area where you may have limited options to contain water for cleaning (i.e. not using your drinking containers). For those with pets, the stuff sack makes a great pet bowl! Aside from storing the cook set, this is my primary planned use for the stuff sack. Although I primarily use it for serving water, it works great for dry pet food as well. Now I no longer have to plan additional space in my bag for some type of dog bowl, it just fits nice and snug as part of my mess kit. Whether you are using it to feed your pet in an emergency evacuation or just cleaning your dishes after a meal, the stuff sacks semi-rigid sides help to maintain its form and keep it from collapsing. All in all, this is an ingenious bag design by GSI allowing for an additional tool in the same amount of space wasted by other manufactures. Well done, GSI. 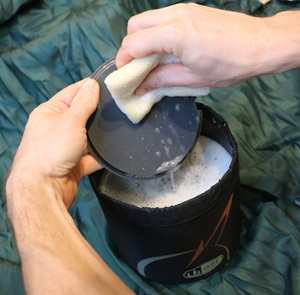 The cook system also includes a small felt stove bag designed for ultralight stoves. It easily fits the MSR Pocket Rocket allowing a small layer of felt fabric protection when stowing your stove in the cooking system. About now you are probably wondering, what the heck is a “Foon”? You are not the only one. Basically it is what GSI calls their sporks that are included with the kit. They are a telescoping sporks that folds into half size for stow. Unfortunately, you should remove them from your kit and get something else of better quality. This is the only piece of gear in this kit that is less than stellar. When new, the “Foon” comes with a warning sticker showing you to watch your thumb when closing it up. This quickly gets ripped off and forgotten. And what happens? Your guests, or worse, your kids go to close up the “Foon” and close it right down on the back of their thumb cuticle cutting it up. Just what you want to deal with during your attempt at your serene and peaceful mealtime. In addition, while I have not had mine fail, there are numerous reviews of them breaking during use. Granted most other comparable kits of this class don’t come with any type of utensils at all, so the kit is still a great value. My recommendation is to take them out, keep them as a spare, and spend a few extra dollars on something else as your primary utensil such as the Toaks Narrow Titanium Spork (Note: the Toaks Spork will not nest in the GSI Dualist kit and will have to be stored elsewhere). The GSI Dualist nested design for the bowls and cups allows for a large area of storage in the middle of the cook set while in stow. We recommend you keep it filled to make efficient use of pack space, and also to keep it from rattling while on the go. Depending on how you pack it, you can hold all the included cook set pieces, a micro-stove, and up to an 8oz canister of isobutane. Usually I carry an MSR Pocket Rocket while hiking with a 4oz canister of isobutane as it gives me storage room for tea, coffee, seasoning packs, or other items with room to spare. I have carried an 8oz bottle more than once but it gets a little tight when packing up and you do not have room for additional packets of seasoning, etc. Only the included pieces of the kit. Isobutane canister nested with Dualist components. 8oz Cylinder (left) is snug while 4oz Cylinder (right) allows additional storage for accessory items. 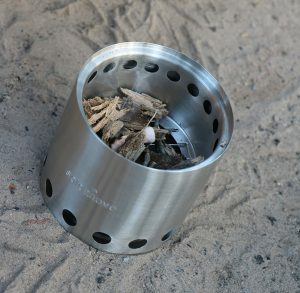 If a micro-stove isn’t your thing, the space is large enough to carry a wood burning stove like the Solo Stove or alcohol stove such as the Trangia Spirit Burner with additional fuel. All of this storage is possible while still protecting the Teflon non-stick coating, as the plastic cups and bowls cocoon around your additional items to keep them from touching the cooking surface of the pot. Again, well done GSI. The table below shows the overall weight of the cook set in different configurations and with different stove systems so you have an idea of the total weight impact on your pack. Weight (ounces) Cook Set With.. The GSI Pinnacle Dualist cookset serves its role well as a backpack cooking system. Though it is designed to serve two people, it can serve a family of four and even a pet with minimal sacrifice. If you are looking for a single system to serve multiple people on a hike or planning to cook for your family after bugging out, the GSI Dualist is up to the task. 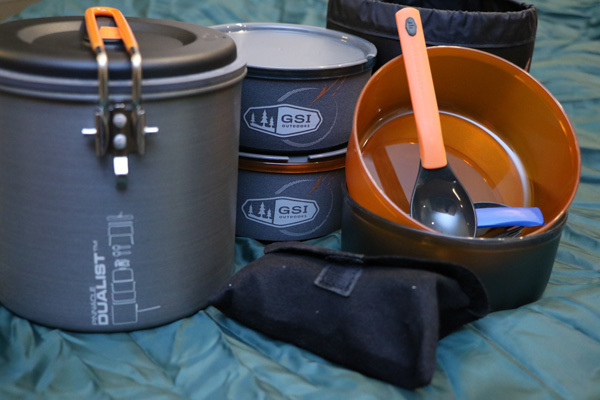 For a full cook system under 30 ounces and a durable, multi-functional design, it is an impressive cooking system from GSI and should have a place in your backpack. If this review helps you with your hunt for a backpack cook set, checkout the system on Amazon by using our links in the article. This helps support us at no additional cost to you so we can bring you additional reviews.